Swimmer Liu Xiang set the first world record in the Asian Games pool and Sun Yang grabbed another slice of history as China sped away on the medals table on Tuesday. 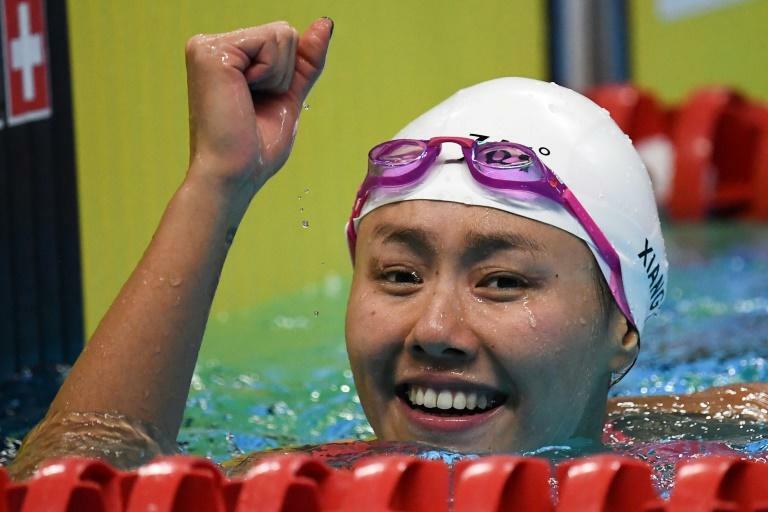 As fans fumed over ticketing chaos and emergency services scrambled to douse a raging wildfire, Liu became the first female 50m backstroker to go below 27sec. Liu, 21, shattered compatriot Zhao Jing's nine-year-old mark of 27.06, set wearing a bodysuit at the 2009 world championships in Rome. Triple Olympic champion Sun Yang powered to his third win of the meet in the 400m freestyle as he equalled Xu Yanwei's Chinese record of eight Asian Games golds. "I've swum six races in three days but I hung in there. It's a nice reward for all the hard work," said Sun. China, runaway leaders on the 2014 medals table, reached 30 golds by the end of day three, with clear daylight between them and Japan on 12 and South Korea's eight. NBA duo Zhou Qi and Ding Yanyuhang also got China home against a Philippines team featuring Cleveland Cavaliers guard Jordan Clarkson in a narrow 82-80 win. Earlier, long queues formed at Jakarta stadium booths as hundreds of fans waited hours for tickets -- only for many of them to be turned away empty-handed. "I've waited here in the heat for hours," Awang, a 67-year-old Jakarta resident who like many Indonesians uses only one name, told AFP. The Games have been hit by significant ticketing problems including a switch to a new online system last week after the original website crashed. In co-host city Palembang, a helicopter and a convoy of fire trucks raced to douse a large fire in countryside that billowed smoke near the Games venues. It came on the day that environmental activists scaled a huge billboard in Jakarta and covered it with a sign saying "#WeBreatheTheSameAir", in protest at air pollution in the capital. Former world champion Nozomi Okuhara led Japan to a 3-1 win over hosts Indonesia in the women's team badminton semi-finals, prompting groans from the home crowd. Japan will play China in Wednesday's final after Chen Yufei's victory over Ratchanok Intanon sparked a 3-0 whitewash of Thailand. China's Chen Yile, 16, won the women's all-around gymnastics despite a musical mix-up when organisers initially played the wrong song for her floor routine. "It's an international competition so anything can happen," she shrugged. Hidilyn Diaz clinched the Philippines' first gold of the Games in the women's 53kg weightlifting, and Indonesia's Eko Yuli Irawan saluted the crowd as he won the men's 62kg. China ruled the mountain biking cross country as Ma Hao and Lyu Xianjing went one-two in the men's race, and Yao Bianwa and Li Hongfeng took gold and silver in the women's. And 16-year-old Saurabh Chaudhary broke India's duck in the shooting competition as he shot a Games-record 240.7 to win the 10m air pistol, his first major title. "What were you doing when you were 16?" tweeted Indian cricket great Virender Sehwag.